On the ground, we collected ourselves and our luggage and tried to decide whether to take a cab or brave public transportation, our customary landing-in-Europe conversation. Do the easy and more expensive thing, or the cheaper local thing? To our delight, we discovered a bus waiting just outside the well-contained and highly organized airport. The “Skybussen” service runs from the airport into central Bergen every 15 minutes, and kids ride free. The driver was a petite blonde lady in glasses, and riding in a sort of co-captain seat next to her was a large man. Both gave friendly greetings when we arrived at the bus stop, and the man helped Jeff load our luggage in the undercarriage. I was hungry and tired, and flying from London to Bergen in the late afternoon in December amounts to feeling like you’ve just arrived on the Redeye, so I asked the driver if I had enough time to run back and get a coffee in the airport. Simple enough. I ran back in, grabbed my coffee, and was out in three minutes. Back at the bus, the driver and her co-captain greeted me again. “I am very sorry to tell you, but beverages are not allowed on Skybussen,” the driver said. In a panic, I looked at my husband and kids at the back of the bus. The driver and the man exploded into laughter. “We told your husband we are going to say this,” they said with much mirth, and motioned me to get on, coffee and all. After this first dose of Norwegian humor, we were underway. Skybussen is comfortable, clean, and modern, and we were in central Bergen in about 20 minutes. The stop was a quick walk from our hotel, Hotel Terminus, in the center of town, which we’d selected for its proximity to the train station where we’d get our transport to Geilo. Hotel Terminus is one of a group of historic hotels in Norway, built in 1928, and its grand hallways and high-ceilinged public spaces have a very Art-Deco feel. 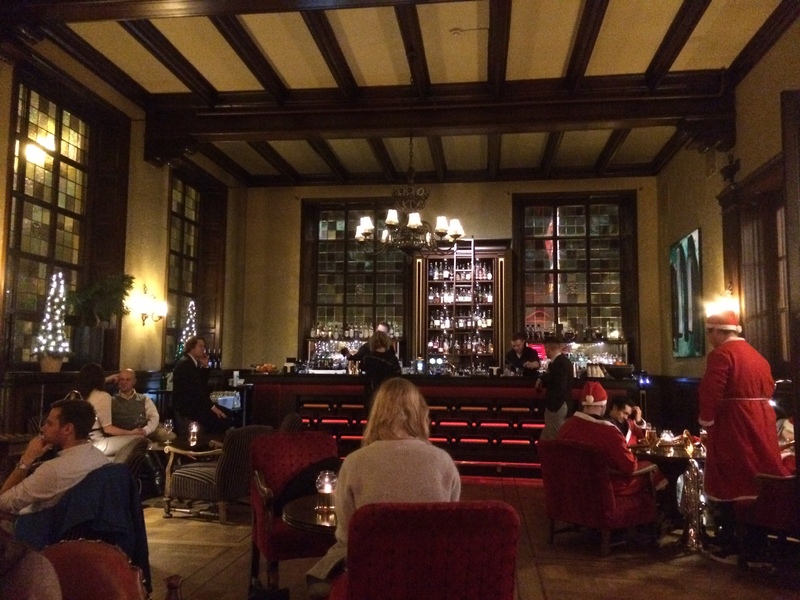 It was almost 8 PM by the time we checked in, so we had burgers in the hotel’s Whiskybar, a beautiful oak-trimmed room presided over by a huge fireplace. A group of musicians dressed as Santa’s trooped in for drinks, a Christmas party was already underway, and the whole atmosphere was very festive. After a night spent listening to the wind rattling the windows, we woke at dawn – which was actually close to 9 AM – and prepared for the day. After a delicious breakfast where we were serenaded with a guitar and vocals rendition of Silent Night by one of the waitstaff, we borrowed some umbrellas from the hotel and set off. Bergen is called the Gateway to the Fjords, and someday when we go back it will be lovely to take one of the many daily cruises among those massive cliffs. As it was on this visit, though, we could barely see our hands. The rain lashed down; a thick rug of fog hovered above the rooftops. This is why the Vikings were such badasses, I thought. We spent the morning on a visit up to Mt. 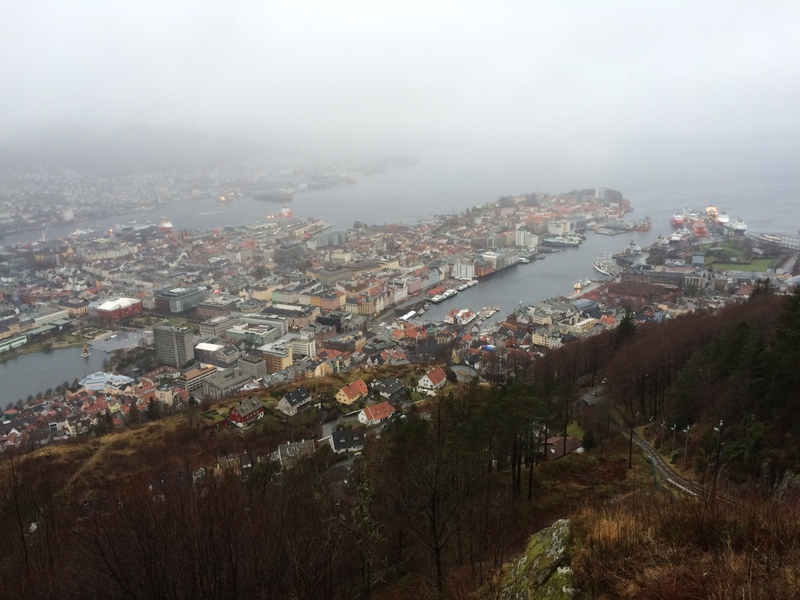 Fløyen, a mountain looming 339 meters above the city. The Fløibanen funicular runs up to the top of the mountain. The ride up was almost as exciting as our flight into Bergen. But the view was incredible – clearing up just enough for us to get a glimpse of the fjords marching out to the North Sea. You can’t see them in this picture, but they were there. As with its Scandinavian relative, Copenhagen, Bergen feels very child-friendly. At the top of Mt. Fløyen is a large evergreen forest steeped with walking paths and secret mossy groves bearing signs warning of witches and trolls. No rain could spoil the experience for the kids. It dried up just enough for us to explore the trails, climb rocks and even test out some playground equipment. Back at sea level, though, the rains came down again. 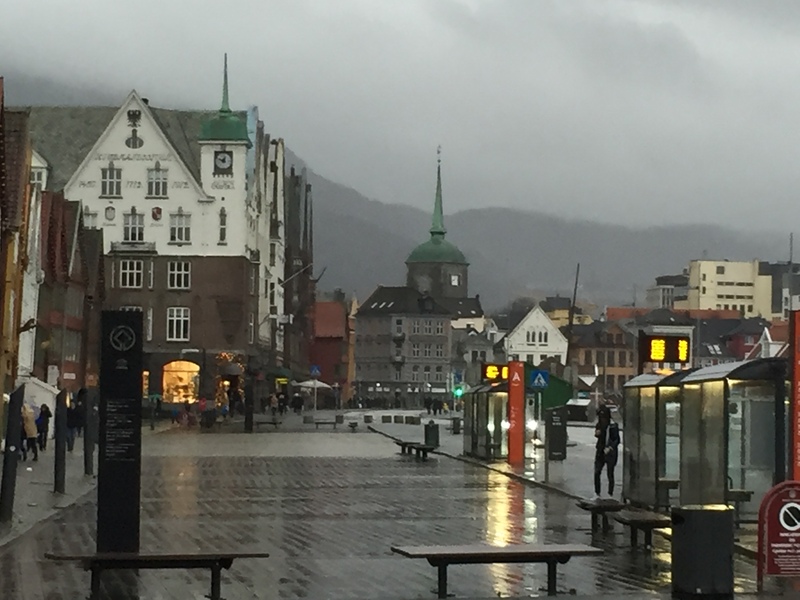 Did I mention how wet Bergen is? There have been a few occasions when I’ve stepped outside during a hurricane in the Northeast US, just to see what the weather’s like. These winds were like that. And the rain was like that. Our umbrellas and hip-length jackets were the proverbial bandaid on a bullet wound. We saw a man wearing a full set of waterproofs like the kind my son wears to Forest School; this is what one should pack for a trip to Bergen. We tried to enjoy a quick walk to Bryggen, one of the world’s oldest Hanseatic ports, where visitors to Copenhagen will be reminded a little of Nyhavn and its narrow wooden houses on the waterfront. It was charming, but we were soaked. And then…through the wind and rain…we saw a beacon, shining from underground. We staggered towards it, descended below into a low-ceilinged stone room…and found ourselves in Bare Vestland, a Norwegian tapas restaurant about which we had done no research, no TripAdvisor comparing. We were soggy and desperate and without expectations, so imagine our surprise when we were granted a high-top table, a set of menus, some helpful English advice from our waitress…and an epic FEAST. Fresh-baked sourdough bread (they swear it’s just a normal online recipe, but there’s got to be more), plukkfisk ( a kind of white fish) with bacon, roast beef, beer stew, roast mackerel – we hungrily gulped each dish as it was set before us, and even managed to dry off a little. Our train for Geilo, a ski resort midway between Bergen and Oslo where we planned to spend a few days in search of some winter magic, was leaving at 3:30, so we headed back to the hotel to change into dry clothes and see what the Norwegian Alps had in store for us. Great – nothing to report from the skiing portion of your trip?